Treat yourself to a celebratory buffet meal with Fairmont Hotel's Spectrum Voucher SALE! Enjoy your favorite dishes from a live culinary theaters at a special price of P1,200 net with Spectrum's exclusive buffet treat. 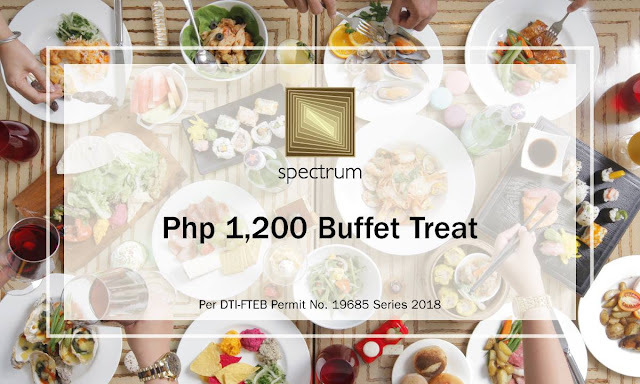 From November 15 to November 30, 2018, lunch and dinner buffet vouchers can be purchased at Spectrum, and can be used from November 15, 2018 to May 31, 2019. Minimum of 5 vouchers must be purchased per transaction. Vouchers are valid for use at Spectrum from November 15, 2018 to May 31, 2019. Sale period is from November 15 until November 30 only. Valid for lunch or dinner buffet; not valid during Sunday brunch. Guest must present the voucher at Spectrum upon availment. Not applicable on black-out dates: New Year's Eve, New Year's Day, Valentine's Day, Easter Sunday, Mother's Day, Christmas Eve, and Christmas Day. Offer cannot be combined with other promotions and discounts. Guests can purchase unlimited number of vouchers. • In the purchase of goods and services, which are on promotional discount, senior citizens/persons with disability can avail of the promotional discount or the discount provided under the Expanded Senior Citizens Act of 2010 or Magna Carta for Persons with Disability, whichever is higher. For inquiries, and more more information, please call Fairmont Hotel at 795-1840 or you can send an email to: spectrum.makati@fairmont.com.